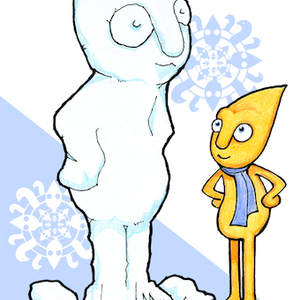 Gustafer Yellowgold is a friendly, yellow, cone-headed fellow, who came to Earth from the sun and has an interesting magnetism for making friends with some of Earth's odder creatures. His best friend is Forrest Applecrumbie, the smartly dressed pterodactyl, with whom he built a small cottage-style home on the edge of an uncharted wooded area in Minnesota. Gustafer has a pet eel named Slim (short for Slimothy) and a dragon named Asparagus who lives in his fireplace. For recreation, he enjoys punching cheese and jumping on cake. Gustafer Yellowgold's Show is a multi-media performance of live music, animated illustrations and storytelling. With its unique crossover appeal, the show has been the wild-card opening act for Wilco and The Polyphonic Spree. Gustafer made his off-Broadway debut in 2008 with Gustafer Yellowgold's Mellow Sensation and will return to the DR2 Theatre in February 2011 for a run of Gustafer Yellowgold's Infinity Sock. Gustafer has toured nationally to arts centers, children's museums, theaters and music venues, with additional performances in the U.K and even Korea!